As a unit who isn’t particularly offensively or defensively inclined, Marth prefers IVs that will allow him to fill more roles on the battlefield. His Resistance is his least useful stat, given that the only units he should be battling that will target his Resistance should be Dragons, and his Speed prevents them from making follow-ups that would KO him outright. +ATK: allows Marth to hit his enemies harder, which is never a bad thing. +SPD: boosts Marth’s Speed to 37, allowing him to consistently avoid follow-ups from almost every pressing threat aside from Mia. HP: at neutral prevents this stat from dipping as low as it would with a bane. DEF: at neutral allows Marth to check physical threats such as green and red armors. 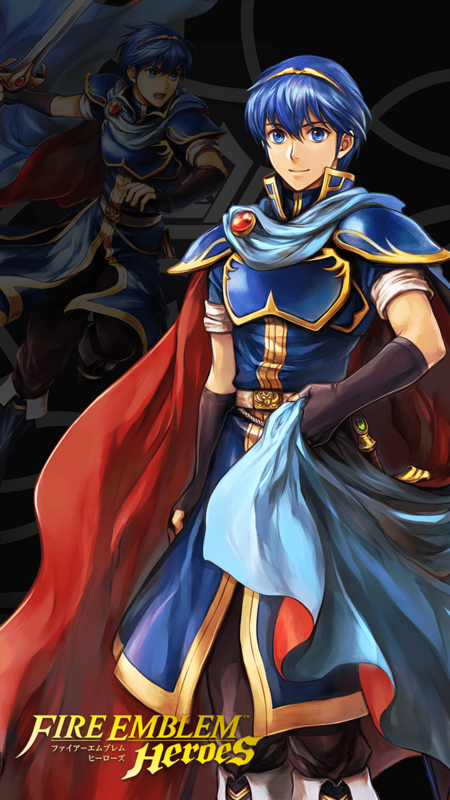 -RES: is the ideal bane for Marth, given that he should be staying far away from mages. As a red sword with decent bulk, it stands to reason that Marth would make for a good Distant Counter candidate. Moreover, the valuable support he can give his teammates through the Refined Falchion’s effect along with an additional Drive skill means that they’ll likely be able to handle any and all threats that give them trouble. +SPD is his suggested boon as it grants Marth the ability to prevent follow-ups from most unbuffed enemies (barring those who carry Brave weapons or Bold Fighter). Though -RES may seem anti-synergistic with Distant Counter, the addition of the Distant Def seal to this build allows him to survive most green Blade mages assuming they are only partially buffed. Refined Falchion is amazing, offering effective damage against dragons, Renewal 3, as well as Drive Atk/Spd/Def/Res 1 all at once. It’s definitely one of the more impressive and potent weapon effects currently in the game, and turns Marth into an excellent support unit who is more than capable of holding his own in combat. Combined with Reciprocal Aid or Ardent Sacrifice, the Falchion allows Marth to provide valuable healing if necessary. Distant Counter allows Marth to check most green mages (including Blade mages) provided they are not fully buffed. It also allows him to KO if not put a sizeable dent in most archers (provided their name is not Brave Lyn, as she totes Sacae’s Blessing). This wouldn’t be possible if not for the Distant Def seal, which adds to his already considerable bulk -- it enables him to take hits from ranged enemies, charge his mid-to-low cooldown Special, and then KO another threat on the field. Marth’s B Slot is perhaps the most flexible part of this build. Quick Riposte is ideal because it guarantees follow-ups while Marth is being attacked, allowing him to bait more effectively. Renewal, however, synergizes with the Refined Falchion’s HP recovery effect, granting Marth 20 HP of recovery every second turn. Swordbreaker is also a potential option here if a team has issues dealing with Sword units, as it allows Marth to check most of them and then heal up the damage he takes with Falchion. Finally, Marth’s C slot can be filled by a Drive Skill of choice. Due to Drive effects stacking, along with Falchion’s effect, Marth will be granting all allied units within two spaces +5 to a single stat, and +2 to all the others. Due to Marth’s physical bulk and his ability to serve as a safe check to most dragons and armors (barring blues, of course), he is able to run a melee duelist build with a great degree of effectiveness. +SPD once again ensures Marth is not doubled by most units, while -RES is patched up by the Close Def seal when battling dragons. Refined Falchion continues to be Marth’s best weapon option, providing 3 unique effects (effectiveness against dragons, Renewal 3, and Drive Atk/Spd/Def/Res 1) at once. The A slot chosen will be largely dependent on what purpose Marth needs to serve. Steady Breath allows Marth to duel other swords much more effectively, especially when combined with the effect of the Close Def seal and Swordbreaker. Together, these three elements of this build grant Marth +10 Defense when attacked by a melee unit, extra cooldown reduction, prevention of follow-ups from speedy swords like Mia, and guaranteed follow-ups against them. It’s a rather potent mix. Quick Riposte is preferable, however, as it offers wider coverage, and 37 Speed is not enough to guarantee follow-ups on greens Marth should be able to handle such as Amelia. Alternatively, if Marth will be primarily battling dragons, Warding Breath is a serviceable option, especially since Marth’s Speed prevents him from being doubled by most dragon units. If the intent is to have him to be able to check all types of melee units, then Close Defense will work here as well. Note that it is suggested to use a lower cooldown Special like Luna in this case, however -- Aether will take forever to charge without Steady / Warding Breath’s effect. If Marth is to instead take a more supportive role, he can run Renewal 3 in his B Slot in order to double the Refined Falchion’s healing. When combined with Reciprocal Aid or Ardent Sacrifice, this makes him a potent combat medic and source of HP management. Once again, his C slot is variable, though a Drive Skill is ideal since it will stack with Refined Falchion’s Drive Atk/Spd/Def/Res 1 effect. Summoners on a budget need not despair -- Marth is perfectly able to run a low investment build that still allows him to perform reasonably well in combat while maximizing his team support potential. The reasoning on Preferred IV choice, Assist choice, and Weapon choice is the same as above builds. Fury gives Marth a nice stat boost both offensively and defensively, while the damage it deals is easily mitigated by the stacked Refined Falchion and Renewal healing effect. Swordbreaker is also another potential option if you need Marth to handle swords, but note that this does reduce his medic utility a fair bit. Low cooldown Specials like Glimmer and Moonbow allow Marth to hit back hard once he takes a hit and counterattacks, while mid-cooldown Specials like Luna and Draconic Aura give him a bit of extra firepower. Once again, Drive skills were chosen for Marth’s C slot since they stack with the Refined Falchion’s Drive effect, and also stack with the Drive Def seal. A Spur can also be used if a Drive skill is unavailable, although more precise positioning will be required in that case. As the ugly duckling of the Falchion users, Marth has been known as a longtime unfortunate pitybreaker… and not much else. Sporting 31 / 34 offenses at base and middling defensive stats, Marth was definitely outshined by his descendants Chrom and Lucina, who possessed more valuable and effective stat spreads and niches. As of the 2.2 update, however, Marth has received a considerable buff due to the Refined Falchion. Possessing not one, not two, but three (!!) separate effects, the Refined Falchion has made Marth become one of the best Drive support units in the game, if not the best there ever was. He’s also able to handle a good amount of common threats himself, to boot. If min-maxed reds who only do one thing and do it well are too inflexible for a playstyle, or one is looking for a sword unit who can cleave dragons in half and look fabulous while doing so, then Marth may be the right unit for a team. The Refined Falchion has three separate effects -- effectiveness against dragons, Renewal 3, and Drive Atk/Spd/Def/Res 1. This is definitely one of the most comprehensive and powerful weapon effects available, and offers an unprecedented amount of team support with a little investment. Compared to his next biggest Drive competitor, Brave Lucina, Marth's offers more Drives with no movement or weapon type restrictions. This allows him to be easily incorporated into a countless number of differing team compositions. Marth’s Speed, when boosted with a Boon, prevents him from being doubled by a vast majority of units in the game. This, when combined with his decent HP and Defense, means that Marth can most definitely defend himself when he needs to. Marth’s Attack suffers since he’ll more often than not want to run a Speed Boon to reach higher defensive Speed Tiers. This does cause Marth’s damage output to take a bit of a hit. With 37 Speed he’s not going to be doubling most units, so he’d appreciate the boost in Attack if he was able to take it. While 23 Resistance isn’t the lowest for a sword unit, it isn’t exactly stellar, either. Marth’s Resistance does compromise his ability to check green Blade mages if they’re fully buffed, which means that he can’t bait them outright. Though this is less of a strike against Marth rather than just a fact of life, Marth faces a lot of competition for a red spot on a team. Although nobody can run Drive sets like he can, Brave Lucina still exists and has comparable Drive-stacking ability. Marth can be slotted into any team composition given his ability to Drive his teammates to high heaven. Since he must naturally stay far away from blues, however, he should always be accompanied by a strong green ally who is able to check multiple blue units themselves. Hard Blue Counters: Hector, Valentine Hector, Amelia, Winter Chrom, Winter Lissa, Halloween Henry, Fae, Myrrh, Dorcas, Brave Ike, Nino, Rhajat, Summer Elise, Performing Inigo, Julia, Deirdre, Sonya, Gunnthra, Cecilia, Valentine Lilina, Spring Camilla, and Cherche are all able to protect Marth from blue threats he should really not be dueling. Marth, as a red without particularly hefty defensive stats, fears pretty much every blue. Of particular note are those who use Brave weapons, target his weaker Resistance, and blue Dragons, who are able to overcome Falchion’s effectiveness against them with Triangle Adept. Blue Brave Users: Reinhardt, Cordelia, Hinoka, Ephraim, as well as Brave Lance Est and Effie all are able to easily KO Marth without him even being able to counterattack. Blue Mages: Linde, Delthea as well as Blade Olwen, L’Arachel, and Summer Corrin easily overpower Marth with magic damage. Blue Dragons: Nowi and Female Corrin can withstand a hit from Falchion if they’re toting Triangle Adept, and in Female Corrin’s case, her high Speed prevents Marth from being able to follow-up on her. This build is a pseudo-healer / Ally Support build by utilizing the (Eff+) Refined Falchion’s Renewal 3 effect along with B slot Renewal 3. IV: +Attack is utilized to give more of an ability to kill off dragons and other bulky units. Weapon: Falchion (Eff+) also comes with stat boosts for allies that work well when combined with C and Sacred Seal Slot stat boosts. One can be used to control how much Health you are giving to others. And the other can be used to heal others, or heal Marth himself. All three have the same usage, to lower defense / resistance upon impact. The deciding factor is how much you want it to do, how fast you want to trigger them off,or if you want a secondary effect to complement it. In this case, Aether provides Marth an opportunity to heal back HP from those he has struck. A-slot: Distant Counter allows Marth to make use of his serviceable defenses to retaliate on ranged units, assuming they don’t nullify his ability to do so first. B-Slot: Renewal 3 is used to increase Marth’s Healing capabilities. Swordbreaker 3 can also be utilized as for defense purposes should you prefer that. C-Slot and Sacred Seal: These two slots are the most flexible, and are up to the player to decide. However, Hone/Fortify, Spur, and Drive skills work extremely well. Especially when different boosts of the same category are choosen. This build is meant to utilize the passive effects of Marth's (Refined) Falchion to the fullest. Skills such as HP + and Renewal will complement the passive effect of Falchion's HP regeneration every second turn, with the former being especially useful if you want Marth to use Ardent Sacrifice to heal teammates. The Threaten skills are optional in this build, if you want to give him some offensive support. Or, you can swap out his Threaten skill with either the Drive or Hone skills to keep him more team oriented when it comes to support. Fire Boost is also optional in this build if you want to use his HP Boon(s) to the fullest. Otherwise, you can give him an HP + seal to make him a bit more tanky and have Ardent Sacrifice less risky to use. Lastly, Astra is also optional to use and could probably be swapped with something else if it doesn't seem helpful. Marth's Falchion refine encourages him to play in a more supportive role. Drive Spectrum grants +2 to all stats to allies within 2 spaces of him. C slot is practically customizable with the use of any of the three Drive skills; atk, spd or res while his Seal slot is taken up by Drive Def 2. Death Blow 3:Just lets Marth deal a little more damage,which is always good to have. Vantage 3:Glimmer is helpful combined with this,as Marth usually has it ready when attacked, due to it having a small cooldown.This lets Marth unleash a more powerful attack before he possibly loses. Threaten Spd 3:Gives Marth a better chance to double. Drive Atk 2:Combined with his refined Falchion,Marth can help his allies deal more damage. Standard Marth build makes best team player. Kills dragons, gives big heals, grants flexible drive boosts - all great utility. Spd boon is the game changer he needed. Escape Route 1Enables unit whose own HP ≤ 30% to warp adjacent to any ally. Escape Route 2Enables unit whose own HP ≤ 40% to warp adjacent to any ally. Escape Route 3Enables unit whose own HP ≤ 50% to warp adjacent to any ally.